Please call 311 to report an illegal seller. 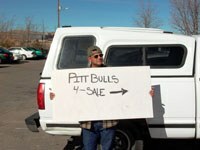 Selling any animal in the City of Albuquerque, without a permit, is illegal! The City of Albuquerque Animal Welfare Department wants to make sure that all people selling animals are properly permitted. Most people do not realize selling animals on the side of the road or by classified ad, without a permit, is illegal. If you witness someone selling an animal or see a sign posted advertising the sale of animals, and you believe they are not properly permitted, the Animal Welfare Department would like to know about it.